Most chunks come in fist size or maybe slightly smaller. I used to like that size but I have gotten to the point where I use a hatchet and chop those down to 1/2 or 1/3 of their original size.. still much larger than chips. When i do a long low and slow cook and want to have my heat deflector in the lowest position on the Kamado Joe, the smaller wood chunks still let me have the firebox mostly full without upsetting the position of the heat deflectors. If your setup doesn't have heat deflectors too close to the charcoal you can use larger chunks, which is the right choice. Such a great video and detailed explanation. Good video. I think you hit nail on head about "clean smoke" learning alot think more smoke better. But learning on a cheap stick burner, burning nothing but logs, it's evidenced clear smoke or blue makes the best food. You run a cheap stick burner, you can do anything. 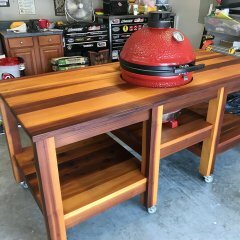 There are days on kamado I'm like what? Grey smoke? I give it time to clear up and as you said could be residual grease, atmospheric conditions, charcoal arrangement. One thing I'll disagree with but could be palate spices etc. Is for me with woods I use. I love cherry for pork, it adds that red tint. Love apple or peach for poultry, pecan does about everything well. Another thing that I've said on this board is there is nothing wrong with chips. Some think they immediately combust and no smoke. I went 22 hrs over 3 cooks never adding and had chips left. I use chunks time to time but I cannot believe a couple splits would ensure you are getting wood smoke. When I light up my kamado, I get thick white smoke which is too much. WHY? what causes it? Is it from the coal? Those with offset units keep loading new wood throughout the cook and they don’t seem to get this dense white smoke. I have tried something different. I have been using western scrub oak which I can get free, is has a mild flavor. I cut a 2 inch diameter piece about 6 inches long. I place it on the bottom with one end at the edge of the fire box. Next I place lump coal all around it. The opposite side will be a few inches from the firebox and I fill that with charcoal. I light that side, the one away from the wood and let it burn across and get a longer slower wood burn for the smoke. With this method, I don’t seem to see this dense start smoke. At any rate, what caused the harsh startup smoke? Simple answer, Lack of oxygen? I'm not buying that one. At startup I usually have the draft open when I get the most smoke. As the heat builds, then I start to close down the draft. I still get the same smoke after damping down but after some time the smoke level drops off. So your premise does not hold water since there is more O2 at start up and less after closing down the draft. The harsh smoke must have something to do with impurities in the charcoal which are driven off as the heat builds. As the fire builds you get more draft...or air flow through the cooker. The more you close it down the less air flow....or oxygen. The wood smolders more than burns...hence the white smoke. Once it comes to temperature and enough coals are lit to produce a good draft....the white smoke dissipates and you get the thin blue smoke. That is after you adjust the vents to compensate for the draft created due to the fire consuming more charcoal. If you didn't the fire would take off and the wood would catch fire. But...if you choke it down just enough to keep a good draft and keep the wood from catching fire......and at the target temperature you get the nice, thin blue smoke. Get the grill to temperature and holding steady...then put the wood on the fire. That typically takes an hour from initially lighting the grill. The white smoke will dissipate in minutes and the thin blue smoke will appear. You don't put the meat on until the grill is ready. That additional information makes sense. I can see having a stable tmp and air flow will have an effect on the smoke as more O2 gets to the fuel. Thanks for the clarification. Get the fire up to temperature and running a good draft, so that it's not putting out lots of [white ...] smoke on its own, before adding the smoking packets. Give the packets time to produce the smoke that you want before adding the food. There's a nice write-up on this I can't find. It has to do with temperature, and the fact that wood doesn't burn, vapor does. When you light charcoal, you heat it until it emits volatile vapor. That vapor then burns, heating the wood and producing more vapor to burn until all the carbon is gone. When you first light a fire, it's not very efficient and the thick, white smoke is a sign of unburned vapors. Food cooked now will taste really bad, but the smoke also smells bad, so use your nose! As the temperature of the fire rises, it becomes more efficient and stops putting out these partial combustion products. The color of the smoke lightens, and now smells more like a campfire than soot. You may now cook. Eventually the fire matures and the smoke goes slightly blue. Smoking wood may or may not add to the smoke color. Smoke ring production is maximized by high CO and NO levels; ironically, there's no wood needed. Finally, the fire runs out of fuel and dies. Disclaimer: if you see open flame from your smoking wood at any time, your cook is in trouble. I have been burying my smoking wood with great success after an early case of open flame. Keeping the lid closed helps. I know but the same principle applies to any grill or smoker. I think the cleanest and best quality smoke you can get from ANY smoker is the smoke produced by a piece of wood that has ignited and is showing a flame. 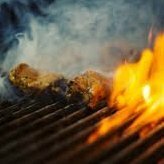 That is the whole premise behind how stick burners (and pellet grills for that matter) work and it's why the food from those smokers has a very unique and distinct smoke profile. The Kamado and charcoal smokers are on the exact opposite end of that. They are slow smoldering wood chunks to create smoke. This is why we use so little wood to do that task. If you used too much you will have a horrible acrid smoke flavor on your meat because it is not reaching combustion. In a stick burner you can use 100% hardwood for your fire. You don't use charcoal and slow smoldering. It's a small hot fire that creates that magic. @John Setzler Thanks for the great video. I like that trick about putting the chips in the foil. Can't wait to try that this weekend. Also, I'm fascinated by your "cheat" with the pink salt. I had no idea.